Rosemary creates keepsake pieces whether it be it for a retiring CEO or Valued Employee. Many of her awards are repeating awards issued once a year. Your invitations for that special occasion are made just for you with every design being unique. You have a choice of having Rosemary's lettering either flat printed, engraved or letterpress. "O Glorious St. Joseph" prayer commissioned by St. Joseph's Seminary, Yonkers, NY and presented to Pope Benedict on the occasion of his Papal visit in April, 2008. An interesting fact about this piece is that Pope Benedict personally took this with him in his "Pope Mobile" when he left the seminary. 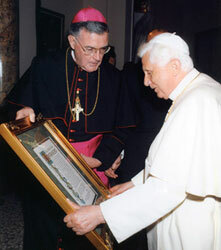 Shapiro presented Pope Francis with a framed scroll welcoming him to Montgomery County in September, 2015. 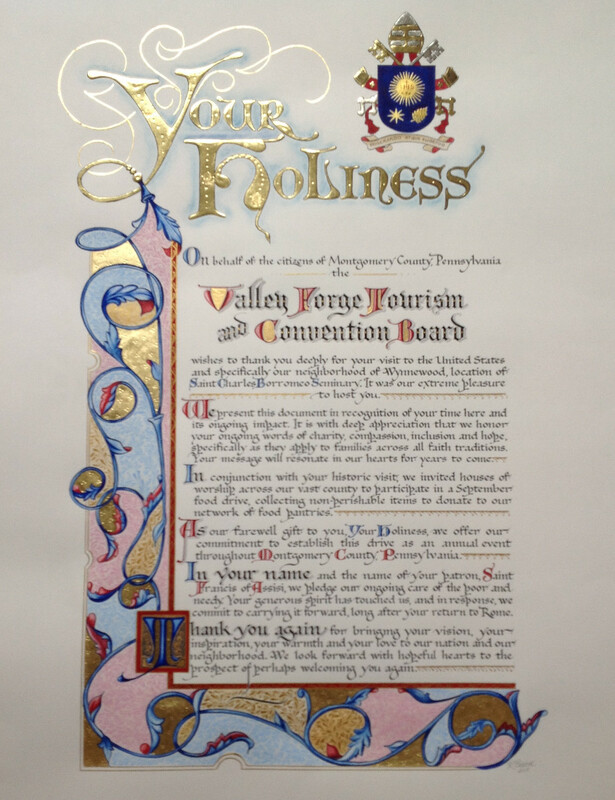 The scroll was commissioned by the Valley Forge Tourism and Convention Board. In 2020, I am offering a class for students who want to dive into Manuscript Illumination! This class will be on calf vellum, using pure ground historical pigments, learning about the binders for the pigments and Ceninno Ceninni’s Gesso. it will include securing the vellum prior to painting, painting an image of a person with intricate fabric patterns, veil, jewels, some architecture or floral design and much more. I have not designed the class as of this posting but it should be posted by the end of this year. If you are interested please contact me. Depending upon interest, I may move the class to a larger venue. If the classes are about 6, they will continue to be here at our home as in the past. In this class we will “fly over” the history of the Illuminated Manuscripts of the Middle Ages in Europe. Our own American penmen of the 19 th and 20 th C were strongly influenced by these very manuscripts. 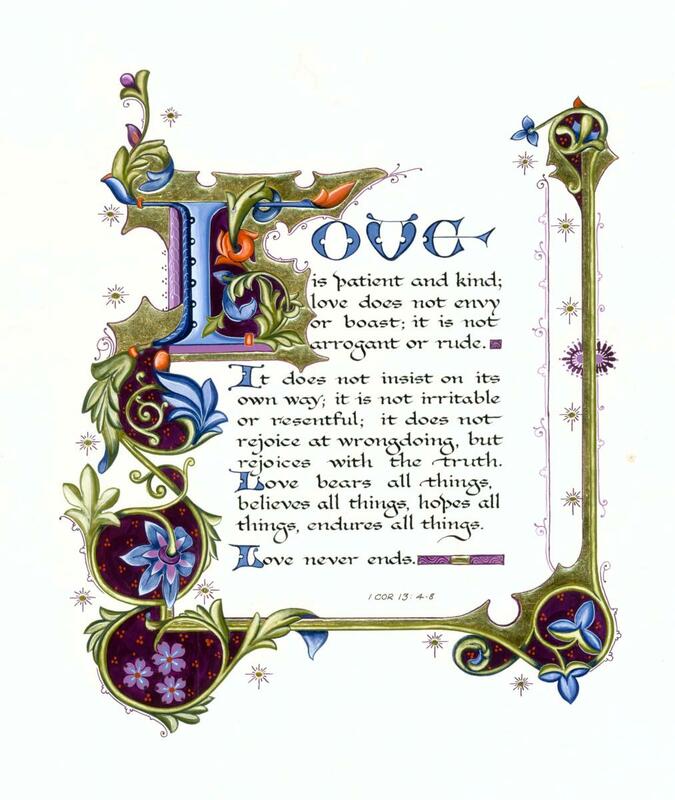 These precious volumes have preserved for us a very special art form for those of us who love the art of letters. 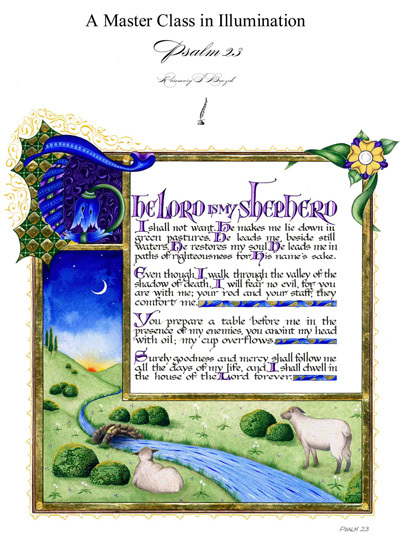 We will study the versal or Missal letter that provide so much opportunity to tell a story in miniature and spend some time drawing the basic shapes of the alphabet. From there we will review the historical gilding technique of gesso. And we will learn how to use Instacoll which is a comtemporary size for use in gilding on paper as well as architectural gilding. Then we will study the basic shape of the Acanthus Leaf which is so heavily used in Medieval Illumination and along with that the importance of the compound curve in creating the layout and design of a text. We will discuss layout with the vine work as the frame. And then we will build our color palette and proceed to work through the steps of creating this piece. Lettering will not be covered in this class as that is for another day. This is a class for improving one’s skills in gilding and miniature painting and the decorated letter in a classical style. By the end of class, it is my hope that we will have discussed the basic Versal or Missal letter, the use and importance of the compound curve, Layout and Design of a text, the proper use of Instacoll and how to handle patent or loose leaf gold, as well as how to choose a color palette. Students will stay at the 5 Star Bed and Breakfast Chestnut Hill on the Delaware in Milford, NJ where breakfast is graciously and abundantly provided. Lunches and dinners are provided by “Chef Stephen”, Rosemary’s amazing husband. The cost of the week includes pick up and return to the airport, lodging, supplies and most meals (with the exception of 2 dinners) All materials are provided for as well. The cost of this class is $1750 for the week. A deposit of $250. will hold your seat for the class you select. Please call with any questions for more details. Rosemary is planning an Advanced Class in Painting and Illumination. This class will cover areas such as painting the face, folds in fabric, painting a jewel or several jewels, as well as a gossamer or "see through" veil. Several students have requested to go deeper and so this class will be scheduled for the spring of 2015. If you are interested please let me know. The class will only allow for about 2-12 students (location to be announced). Students who have previously attended her classes will have first preference. This class will not be for the faint of heart. It will be a wonderful experience in ground pigments as well. A refundable deposit of $250.00 will hold your space now. If you have further questions please feel free to call the studio or email me at rosemary@gildedquill.com. 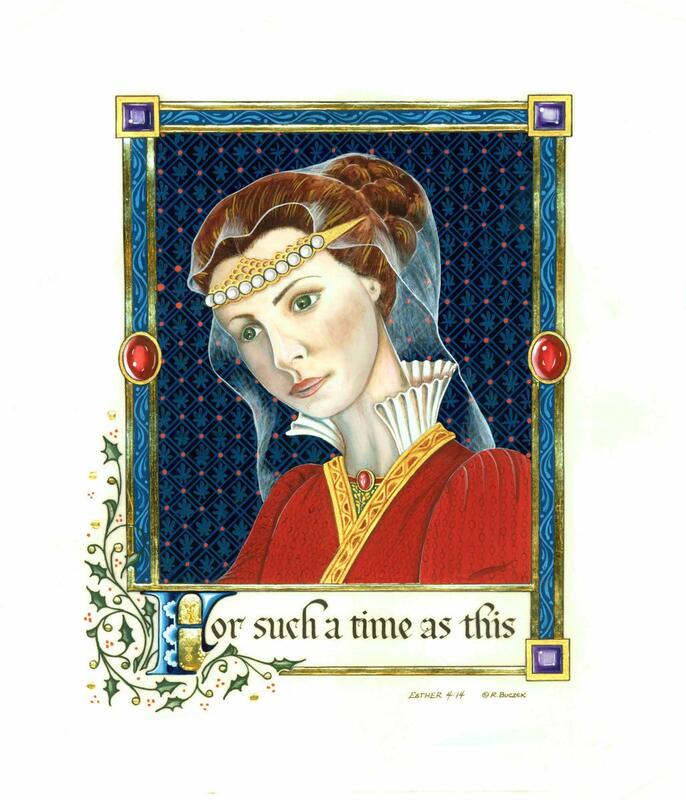 This class, Queen Esther, is painted in ground pigments on calf vellum although some are choosing watercolor paper. We do some gilding as well as paint the face, fabric with pattern and folds as well as gossamer veil. Then we do pearls, amethyst and rubies. We do some reverse embroidery on shell gold as well. And yes, we do some gilding. So we cover a lot of ground in 6 days. The purpose of the class is to provide instruction as to how to accomplish some of these unique painting elements common in the manuscripts of the middle ages. Every one stays at Chestnut Hill on the Delaware which is a 5 star B & B which perches on the Delaware River. Breakfast is there at the Inn and then my husband, Steve is the chef here and he prepares our lunches and dinners! We cook fresh and we try to accommodate everyone's diet needs. (We also cook mostly vegetarian for ourselves) We are happy to accommodate. Only 6 in the class as that is how many I can seat at my dining room table. We don't have a large house but it works well for this class. Students who are out of the area fly into Newark International Airport and we pick everyone up on Sunday and class is Monday through Saturday and then everyone flies home on Sunday. We pick everyone up and return everyone and no supplies are needed. We provide all the supplies to be successful. In this class we cover raised gilding, flat gilding, gold grisaille and many brush techniques to accomplish Psalm 23 which is posted here. We break the rules a bit and push the boundaries a bit as as we use watercolor, gouache as well as grinding our own pigments to accomplish this piece. All materials are provided so the student needs only come with their personal things. Accomodations are hosted at the beautiful 5 star B & B Chestnut Hill on the Delaware, a beautiful Victorian "painted lady" hosted by a lovely couple whom I have know for over 25 years. www.chestnuthillnj.com Breakfast is provided at the Inn and lunches and dinners are provided by my "chef" husband, Steve. For more information please contact our studio.